We are proud to offer the excellent Seconique Tempo Sofa - Two Seater Sofa in a Box - Fabric or Faux Leather - Choice of Colours. With so many on offer today, it is great to have a brand you can trust. The Seconique Tempo Sofa - Two Seater Sofa in a Box - Fabric or Faux Leather - Choice of Colours is certainly that and will be a perfect purchase. 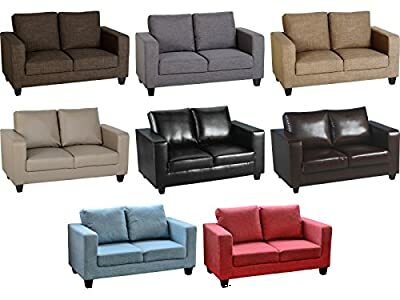 For this price, the Seconique Tempo Sofa - Two Seater Sofa in a Box - Fabric or Faux Leather - Choice of Colours comes highly respected and is always a regular choice with lots of people. Seconique have included some excellent touches and this equals great value. Tempo 2 Seater Sofa by Seconique - Sofa-In-A-Box Choice of Faux Leather or Fabric Material Solid Wood Feet - Quality Build - Comfortable & Hard Wearing DIMENSIONS: Width: 140cm Depth: 75cm Height: 84cm - Approx Mainland UK Delivery Only. Sorry but we do not deliver to Scottish Highlands & Islands, ALL offshore Islands & Ireland.